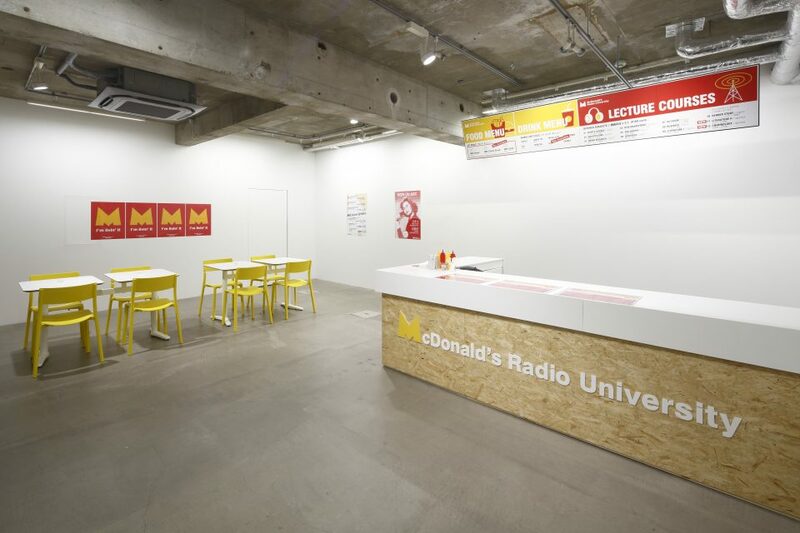 MISA SHIN GALLERY is pleased to announce McDonald’s Radio University, a solo exhibition by Takayama Akira, from Friday, November 23, 2018 to Saturday, January 19, 2019. Born in 1969, Takayama Akira is a theater director and artist who embraces a broad range of non-conventional performance methods in a bid to expand the concept of theater within contemporary society. They include installations, touring performances, social experimentation projects, discourse events, sightseeing tours, videos, and many other approaches. The project was premiered in 2017 across seven McDonald’s stores in Frankfurt, Germany. The professors stationed in each of the stores delivered their lectures via lapel mics, ransmitting throughout the store. 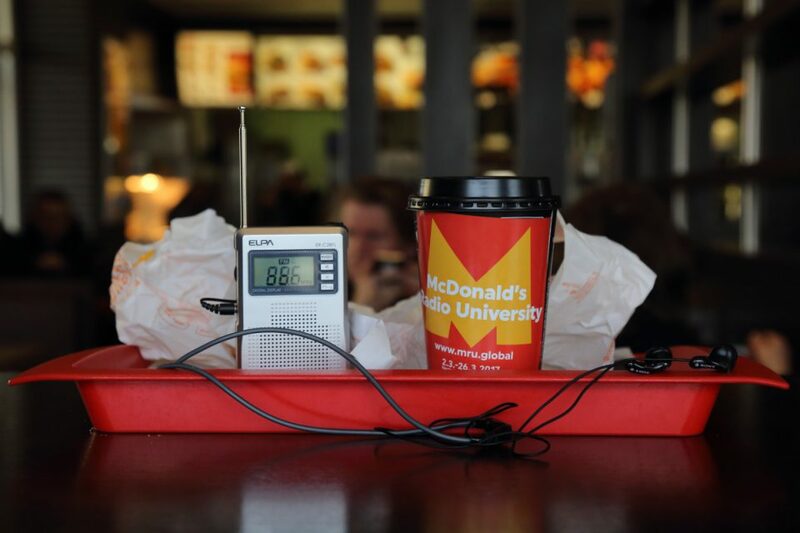 Students used portable radios and earphones distributed at the counter to tune into their lectures in real time. The professors in Frankfurt were all refugees, coming from countries such as Afghanistan, Syria, Pakistan, Ghana, and Iran, and speaking on a total of fifteen topics encompassing philosophy, music, architecture, biology, natural science, and journalism. The fast food restaurant McDonald’s is renowned as a symbol of global capitalism, and has gained a reputation for serving up unhealthy junk food. Yet in Europe, where class divides and other social divisions are becoming impossible to ignore, it is also a place that welcomes immigrants and refugees as both customers and staff, and a location where many ethnicities, races, religions and ages of people coexist. 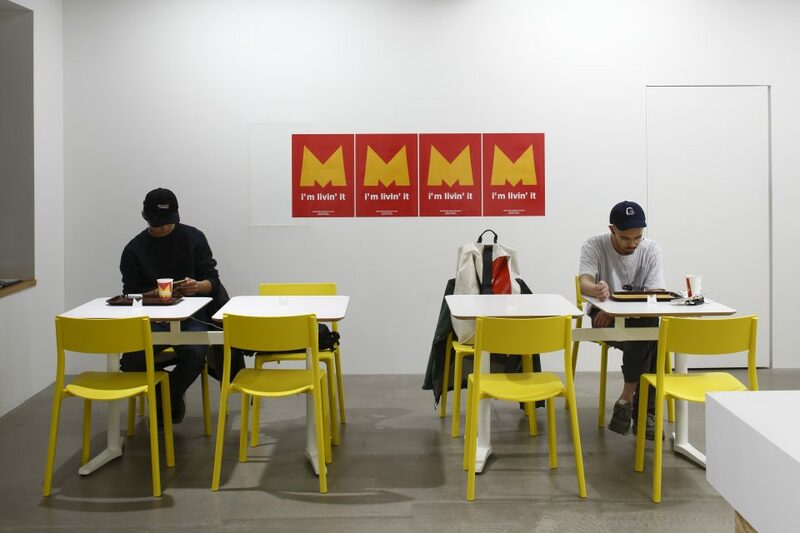 By taking McDonald’s as his setting, Takayama unveils deception that art criticizes social problems from on high, designing his project as a shifting device that can enable us to learn from the world as it really is. Born in 1969. In 2002, he formed the theater company Port B, and since then has been producing installations, touring performances and social experiments utilizing urban spaces as a way of engaging with cities and societies across the world. In recent years, collaboration with those from other fields including visual art, tourism, literature, architecture, and urban researches has seen the scope of his practice broadening further, and he has applied his theatrical philosophy and methodology to opening up new possibilities in a variety of fields. Major works include the Our Songs-Sydney Kabuki Project (Sydney), the Wagner Project (Yokohama), McDonald’s Radio University (Frankfurt, Berlin), Tokyo/Heterotopia (Tokyo), Piraeus/Heterotopia (Athens), Beitou/Heterotopia (Taipei), Beirut/Heterotopia (Beirut), Yokohama Commune (Yokohama), Compartment City – Vienna (Vienna), Referendum Project (Tokyo, Fukushima, etc. ), and The Complete Manual of Evacuation (Tokyo, Frankfurt). He has participated in major exhibitions, such as Yokohama Triennale (2014), Maison Hermès (2015, Tokyo), Roppongi Crossing (2016, Mori Art Museum, Tokyo), Sharjah Biennial (2017), and Biennale of Sydney (2018). He is an associate professor at the Graduate School of Film and New Media, Tokyo University of the Arts.